I love the speech. David McCullough, Jr. did an excellent job framing his argument, using humor, and being direct in his opinions. I guarantee the speech caused most people in the audience to think differently about something, which is the point of good speeches. I also liked his attack on cliches. He closes the speech with powerful - albeit not new - advice on how to succeed: don’t wait for success to come to you, and do things for selfless reasons. Good stuff. It is conventional wisdom now to believe that kids are too pampered, and that parents bolster their self-esteem too much. Of course these things are true in some cases, but is this really a big issue? College applications are more competitive than ever. Job applications are more competitive than ever. Do we really think these kids aren't capable of seeing that real life doesn't have 7th place ribbons like their soccer league did? We critics of this generation should take it down a notch. It’s true that many parents overdo it with praise and are too quick to rescue their son or daughter from mistakes. But, there are bigger problems in our world, right? What about the parents who overdo it with criticism? What about those who are absent? Shouldn’t we be more concerned about them? These kids are starting their lives. A knight who goes to battle in armor will likely get hurt. A knight who goes to battle without armor will likely get killed. Parents spend 18 years trying to strengthen the armor, and too many of us take joy in the chance to strip it off. We're at war with youthful exuberance. Just so we can tell these kids how it really is. Or maybe, feel better about ourselves? I like young people to be brash, full of confidence, and ready to just go for it. To feel bulletproof. That’s their thing. The contribution that 18-25 year-olds make to the world is their enthusiasm. Their optimism and self-efficacy are their gifts to the rest of us. They bring balance to our universe. I used to hate overconfidence in young people. I’d mumble “they’ll learn” under my breath. Now, more often than not, it makes me smile. Why shouldn’t they be overconfident? Maybe I just want some of it back. Confidence and brashness is always beaten back by reality. That’s life. That’s the journey we share. But why do we want young people to reach the end of the journey before they even begin? The most relevant messages in our world are the ones that hit home. As I watched Mr. McCullough’s speech, my initial reaction was to join in his criticism. But then, I realized that he was speaking to me too. In many ways, I am no different than the kids sitting out on that field. Becoming truly selfless runs parallel to finding the answers to life itself. It’s a destination we all will likely never reach, but should try anyhow. That’s why I love older people. They are closer to that destination, and have learned so much along the way. That’s why they stand at a podium and give commencement speeches trying to impart their wisdom to the young and innocent. And the young may listen, but not truly hear it. What’s really wrong with that? Is it more unfortunate that they don’t have cynicism about their specialness, or that we adults have totally succumb to it? Maybe we should listen to them. I posed a question to a group of colleagues I respect immensely, and who work in the youth development field: if the goal is to prepare young people for the tough life ahead, is a greater service to them to tell them they are not special, or to tell them they are? My wise colleagues correctly pointed out that there is a middle ground. I think we should all be cautious, however. When us adults look a young, energetic, seize-the-day kid in the eyes and tell them that are just average/ordinary/not special, are we doing it for their benefit, or for ours? Oh sorry - I speak in acronyms sometimes. 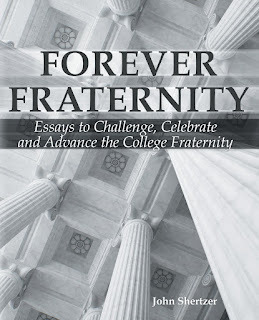 FEA is Fraternity Executives Association. No problem, we use acronyms a lot in our organization too. Higher ed is full of them. We have NIC, AFA, NPHC, AFLV, NGLA, SEIFC, SEPC, NASPA, ACPA, and UIFI. Just to name a few. I bet it's really weird for others to hear these. These things are just better known for their acronyms. How about you? What are you in town for? I am also attending a meeting. It’s the annual meeting for the Association of Blatantly Correct and Dentally Energized Farmers Growing Horrendously Important and Judiciously Khaki Legumes Mostly for Nourishment, Ointment Production, and Quasi-scientific Reindeer Science That Undoes Viral Warts on Xenolithic Yellow Zymoids. It’s better known by its acronym: ABCDEFGHIJKLMNOPQRSTUVWXYZ.